Aspidistras were all the rage in Victorian England and are still a staple in many gardens today. Here’s a look at these classic, easy to care for and hard to kill plants. Few houseplants would be happy in low light, poor soil or drafty areas but the Aspidistra is one exception. Unlike many popular houseplants, it is not tropical in origin and as a result does well in many surprising places. It’s very easy to care for and will thrive for even the blackest of thumbs. Get to know this beloved houseplant! Aspidistra, better known as the Cast Iron Plant, has been around for over 100 years and was a staple in Victorian parlors. It was introduced to America in 1824, and although it has gone in and out of style it is still popular today. Native to China and member of the Lily family, the plant got its nickname due to its near indestructibility and habit of thriving in the darkest of rooms. It was popular in Victorian times because the homes at the time were dark and poorly heated, yet the plant flourished. Aspidistra is a nearly fool proof plant that even the blackest thumb can succeed with. Aspidistra are slow growing plants with large, long, dark green leaves that grow directly from the soil. Resembling the corn plant, they reach an average of 2 feet. In ideal conditions they do flower, but the blooms are an unappealing purplish brown and often go completely unnoticed because they are located very close to the soil surface. True to their nickname, these plants are durable and can be grown almost anywhere. They tolerate poor lighting, cold air, drafts and even sparse watering. Keep it away from direct sunlight or the leaves will burn. The only thing that will kill it however is overwatering, especially if it’s in poor light and cool temps. That combination quickly leads to rot. Although it will happily tolerate dry soil, try to keep it evenly moist for best results. Feed monthly with a high quality liquid fertilizer designed for houseplants and repot every 2-3 years. Cast Iron Plants can be easily propagated through division. In the spring separate them into small clumps, making sure each one has healthy roots and at least 2 leaves. Pot up and they will quickly root and form new plants. These plants are generally problem free but occasionally spider mites or scale may attack. For scale, spray with Neem Oil if the infestation is light, otherwise the plant may need to be discarded. Spider Mites thrive in hot dry air so keep humidity levels up and temps moderate to prevent, and to eradicate, raise humidity levels and spray plant liberally with warm but not hot water. Aspidistras also make great plants for the urban garden. They do just fine in containers or in the ground and can be grown on patios, balconies and porches. They also make a lovely addition to cut flower arrangements as the foliage is both attractive and long lasting. 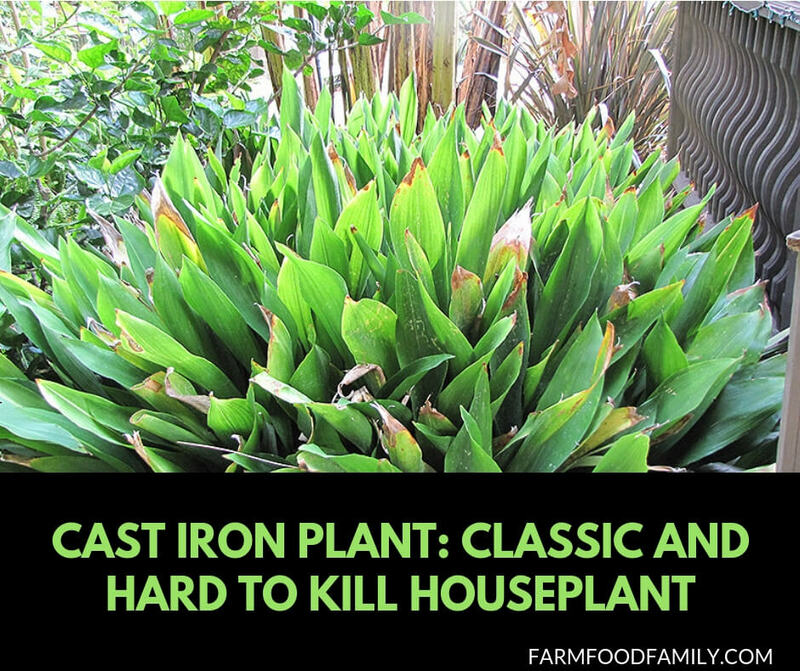 Cast Iron Plants are decorative, durable and have been a beloved houseplant for over 100 years. They are the perfect plant for green and black thumbs alike!